Blue Mountains Blue Wave "Celebration of Mountain Life"
This site has been preserved for future generations, we hope you enjoyed meeting the Blue Wave team along the journey. 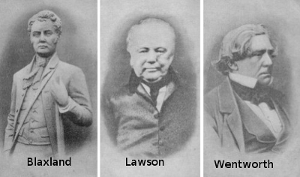 In 1813, Blaxland, Lawson and Wentworth became the first Europeans to cross the Blue Mountains. As we near the bi-centenary of this incredible journey, plans are being put in place to celebrate this momentous achievement and occasion. As part of the run-up to the anniversary, “The Blue Mountains Blue Wave” has been established to help celebrate mountains life with walks following the route taken by the three explorers. The inaugural walk commenced in May 2009, starting at the Nepean River, on May 10 finishing on 31 May with the second and third walks planned for 2011 and 2013 as a countdown to the bicentennial celebration of the original crossing. As not all of the original route is accessible, the inaugural walk was via public schools along the way. The walks bring together local Indigenous elders, school children, invited guests and celebrities as a way of joining together the citizens of the special area in a celebration of a sense of place, space and time. Suitable activities could include art or craft displays, dance or drama events, composition and/or performance of songs or poems, sporting and athletic displays or competitions. Activities should incorporate some form of link to the concept of celebrating the Blue Mountains and our sense of place, space and time.